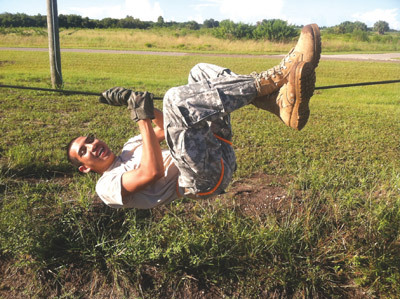 Cadets will compete in this kind of one-rope bridge contest. Major Rick Coles photo. More than 20 of the best U.S. Army Junior ROTC programs in the state are expected to be at South County Career Center, 2810 John Sherman Way, Ruskin, on Saturday, Sept. 27, for the third annual Invitational Raider Meet. The event will feature more than 600 cadets from five counties competing in five events. Add instructors and visitors, and the attendance is expected to swell beyond 1,000. The competition combines physical fitness with team building and problem solving. Each participating JROTC program will bring up to three teams of 10 cadets each, and will compete in three categories: male, male mix and female. Teams from within a 100-mile radius, including perennial state championship competitors Alonso, Braden River, Newsome and Boca Ciega will be among those competing for honors at the event. The teams will compete in a two-mile team run; a one-rope bridge; a simulated casualty carry where cadets carry sandbags; a sandbag relay; and a tire flip. Preparing for the competition has already helped Coles’ young cadets. “I’ve already noticed as we have prepared for this event that we have had a huge improvement in our physical fitness, in our teamwork, our mental discipline and our commitment to compete,” he said. More than 30 percent of the school population at the career center are members of the Junior ROTC program, which graduates the highest number of seniors each year, Coles said. “Last year, we graduated 40 percent of the school’s seniors,” he said. Discipline, motivation and purpose are the core drivers of the Junior ROTC’s program success at the school, which also offers culinary, emergency medical responder, construction and nursing programs. Anyone interested in supporting either Coalition Wounded Warrior or SCCC JROTC is encouraged to call Major Rick Coles at 813-569-9065 for more information. 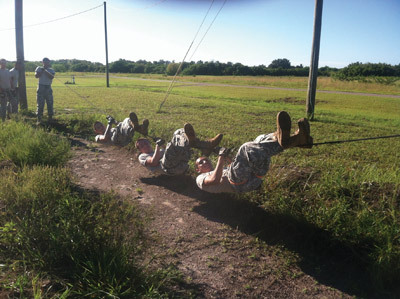 Navigating the one-rope bridge is just one task for cadets. Major Rick Coles photo.